Your Wellist Support Plan will be created just for you. No two plans are alike. We focus on your health. 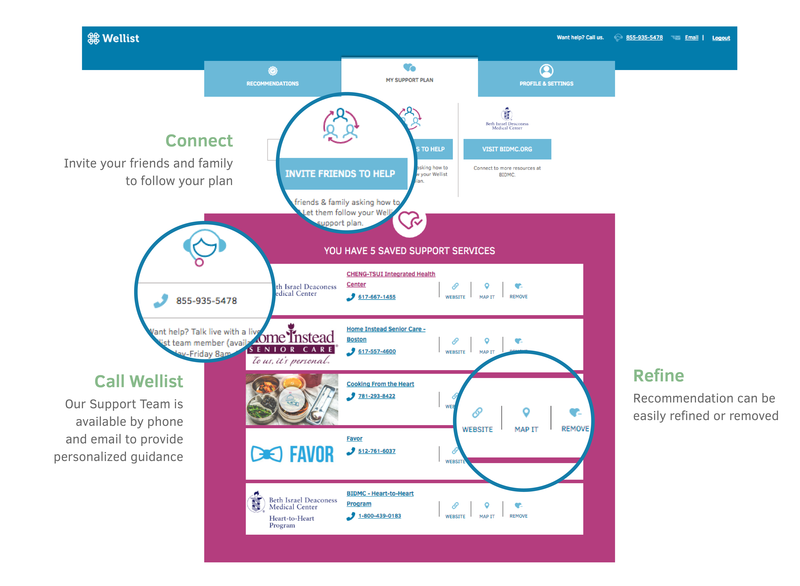 Beth Israel Deaconess Medical Center has teamed up with Wellist to offer you personalized recommendations for support services. Compare your recommendations by cost and distance from you, and discover hard-to-find resources. Massage and acupuncture services that are in town, at your hospital, or mobile. To see more service categories, simply scroll through the boxes to the left. More than a quarter of families receiving treatment at the Massachusetts General Hospital Cancer Center are using Wellist. See what some of them have to say. As a support specialist, I get to work with patients and caregivers to find those specific resources that can make all the difference. It's wonderful to help ease the stresses of everyday life during a challenging time. Are you a patient, caregiver, or a vendor interested in being listed on Wellist? Wellist is a complimentary service offered by Beth Israel Deaconess Medical Center to its patients. BIDMC does not endorse any of the services or vendors suggested or referred by Wellist. Further, the lists of services and vendors provided by Wellist are not exhaustive and many similar services and vendors are likely available to patients. Services and vendors mentioned or omitted do not constitute endorsement or disregard. Patients are solely responsible for determining if a particular service or vendor is acceptable. BIDMC assumes no liability for any patient’s use of Wellist or any of its referred services or vendors.